Brad Taft was interviewed in the January 2014 Greater Phoenix edition of Attorney at Law magazine. He and other members of the Forensic Expert Witness Association were featured in a special section on the expert witness field. His profile is shown below. 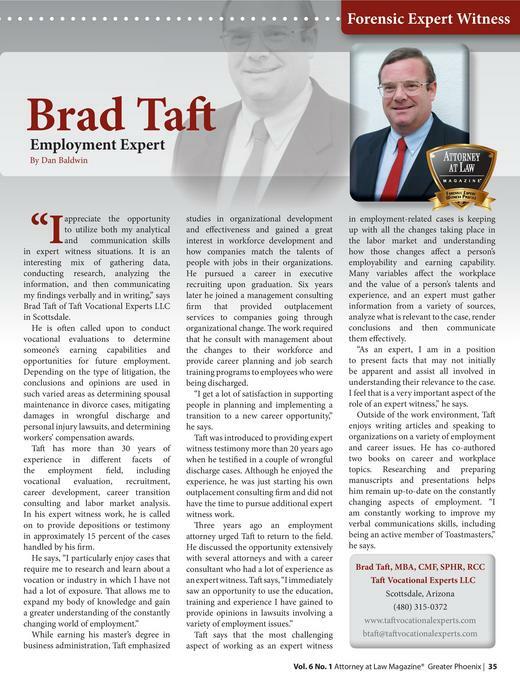 Brad Taft, Managing Director of Taft Vocational Experts, has received the SHRM-SCP certification from the Society for Human Resource Mangagement. The SHRM Senior Certified Professional designation demonstrates mastery of the competencies and knowledge most important to the Human Resource field and strong commitment to the advancement of the HR profession. SHRM is the world’s largest HR membership organization devoted to human resource management. Representing more than 275,000 members in over 160 countries, the Society is the leading provider of resources to serve the needs of HR professionals and advance the professional practice of human resource management. For more information on the SHRM-SCP certification, click here. Certified Forensic Litigation Consultant (CFLC)™. San Francisco, CA (January 29, 2016) - The Forensic Expert Witness Association (FEWA) Board of Directors, on advice of the FEWA Credentialing Committee, has awarded Brad Taft the professional designation of Certified Forensic Litigation Consultant (CFLC). Taft is Managing Director of Taft Vocational Experts LLC, in Scottsdale, AZ which provides expert witness services in employment-related lawsuits. He has provided expert reports and/or testimony in over 90 cases involving divorce, wrongful termination, wrongful death, and workers compensation. Founded in 1994 in Orange County, California, the Forensic Expert Witness Association (FEWA) is dedicated to the professional development, ethics, and promotion of forensic consultants in all fields of discipline. FEWA brings together a diverse group of professionals sharing common goals related to forensics. The association offers to its members the opportunity to enhance their knowledge and techniques required to perform in an effective manner. For more information on the CFLC Designation, click here.